GO’s Transit Safety Officers are responsible for ensuring your personal safety. Our Transit Safety Officers are identifiable by their uniform. 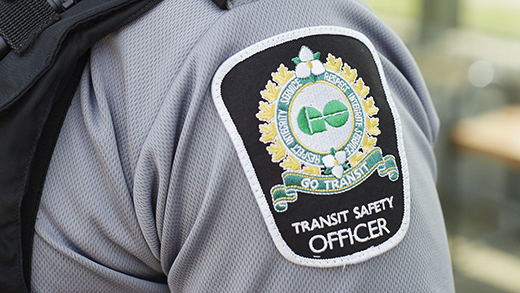 Every uniform includes a hat and shirt displaying the Transit Safety shield, along with a black vest that says “Transit Safety Officer” on the front and back. Officers are authorized to enforce GO Transit by-laws, which govern passenger conduct, fare inspection, and use of our facilities. To ensure you have a safe ride, officers are authorized to enforce the following statutes: The Criminal Code, Controlled Drugs and Substances Act, Youth Criminal Justice Act, Trespass to Property Act, Liquor License Act, Sections 17, 28, 33 of the Mental Health Act, and Safe Streets Act. To ensure the highest standards of professionalism and accountability, Transit Safety Officers are designated as “Special Constables” through a sponsorship program with the Ontario Provincial Police and the Ministry of Community Safety and Correctional Services. Visit the Metrolinx Transit Safety Officer recruitment webpage to learn more. Education is key to injury prevention and keeping everyone safe around railways. GO Transit Safety Officers continually reach out to various communities, addressing local issues promoting railway safety through special events and presentations. Here’s the Safety Infographic that we issue to high school students in GO service areas. Feel free to download it if you’re an educator! If you would like to host a railway safety presentation in your community or school to learn more about the dangers of trespassing on railway property, please contact Operation Lifesaver. If you work in law enforcement and are looking fo even more rail safety tips, follow this link.